It's December 1st, but it might as well be NBA Christmas Eve in Ohio with all the anticipation surrounding LeBron's return to Cleveland. You'd think LeBron was Santa. Actually, that's a VERY BAD analogy (i.e. more suitable would be those letters flipped around to spell "Satan"), since I don't believe most people are excited about LeBron's return to the Quicken Loans Arena for the "right" reasons. What are the "right" reasons? I don't know. I do know that people who were originally going to skip the game for safety concerns or to avoid the mess, are now ponying up the dough and texting me that they'll be there and/or wanting to know if I have time to meet up before the game. **** If you're going to be at the game and you know me, please text me so we can catch up. I'm in Ohio. I came in this morning because my mom is having a surgical procedure tomorrow. I will be at the hospital bright and early and when she is home recovering (i.e. hopefully knocked out on meds) and under the watchful eye of my brother (i.e. a non-practicing physician) I will be on the road to Cleveland. If my mother isn't knocked out on drugs, I guarantee that she will be in front of the TV watching the game. It's all she can talk about, and she's not a LeBron fan. She's an NBA fan because of me. She's familiar with the Cavs because of me. 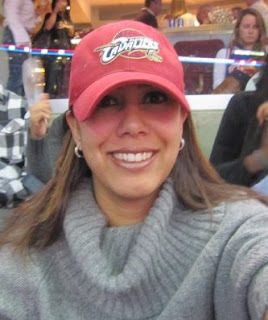 She's gone to a few Cleveland Cavaliers games with me. Now that I think about it she's even been to Richfield Coliseum. Athough she may not be all up to date on the nitty gritty (i.e. she asked me if Gund Arena and the Quicken Loans Arena were two different buildings while we were eating dinner tonight), she's still going to be rooting for the Cavs. Now that I think about it, my brother lives in Miami and he's flying tonight. Hmmm, maybe it's a good thing that I'm not going to be at home for the game after all. **** Actually, I just literally asked my mom who she's rooting for and she stared at me blankly. What the heck is going on around here?!!? Give me strength. Wow. She just asked me if the Cleveland Cavaliers are any good. I must remain silent. I cannot antagonize her before her surgery tomorrow. Do you think LeBron is going to do the talc/chalk thing before the game tomorrow? I say, YES. I think if he had the nerve to do the show "The Decision", why not throw some talc in the air? I think his bravado won't make him refrain from the pre-game production. I've heard LeBron make mention of the visitor locker room. I can't remember if I've been in there or not, but even if I had I'm sure it's been remodeled through the years. If you're familiar at all with the tunnels of the Quicken Loans Arena, you know that the visitor locker room is the first one on the left right when you hang a right from where the bus parks. If I remember correctly, the referees locker room is next and it's on the right if you proceed down the hall. The home locker room is all the way through the tunnel past the family lounge and the home tunnel. Unless LeBron really feels like greeting the arena employees, his interaction with the crew will probably be limited since he doesn't have to go that far into the building. I wonder what sort of reception he'll receive from the always professional security staff. Regardless, because of the set up, who really cares about the visitor locker room. Sure it's smaller (i.e. I've seen teams stretching in the halls pre-game), but it has everything the Heat need. Wait. Cutie, Coach Erik Spoelstra will be in Cleveland too. Hellooooo. I wonder if Zydrunas will do me a favor and give him my number. Hahaha. But seriously, enough years have passed. Can't we all just get along?!!? I'm looking forward to seeing Byron Scott coach the Cavs. As a former Lakers fan, I am a Byron Scott fan. I hope the game is competitive. I hope the Cavs come out blazing at that everyone plays at the top of their game. I would love to see the Cavs win. If the Cavs win, I'm sure the dynamic three-o (i.e. Chris Bosh, Dwyane Wade, and LeBron James) will allude to the fact that they didn't get much rest after playing the Detroit Pistons. Wow. How exciting would it be to see the Detroit Pistons defeat the Miami Heat tonight? OK. Maybe now I'm dreaming. But like I said, it's only December 1st but it feels like Christmas Eve for basketball fans in Northeast Ohio. Instead of putting up stockings and laying out cookies, I'm sure kids and adults are breaking out the markers, making posters, and/or printing T-shirts in preparation for tomorrow night's game. It should be a sight, and with the holiday season approaching now is the time to dream and make a wish or two! **** How do I know? One of my wishes already came true earlier today. Don't know what I'm talking about? Don't even worry about it.